Let's face it, in this day and age it can feel near enough impossible to keep up with the trends and the flawless insta makeup. Everyone these days post a thousand flawless selfies a day and I can't even take one semi decent photo of myself, that I would even contemplate posting online. If I'm not looking spotty, I'm looking shiny. I give up taking flawless selfies of myself before I even try to be honest. Although I'm not a girl with baby soft flawless angel skin, I do like to try my best. I have always used Rimmel's Lasting Finish Foundation and Stay Matte Translucent powder to give me that medium/full coverage finish. I've been using the same products for years and have always trusted Rimmel especially with my base products. I was after a new Stay Matte Powder after hitting pan and noticed Rimmel's new #Insta collection. As any makeup obsessed deal grabber would have done, I made use of the Boots 3 for 2! The first thing I just new I had to try was the #Insta Fix & Go 2 in 1 Primer & Setting Spray. It has been absolutely baking recently and us Brits just don't react well to the hot weather. I'm never prepared and I never know the correct way to go about things in the Summer (full makeup/no makeup?). I had never really tried a setting spray and I'm not one for primer, but with this hot sweaty weather I figured I could use all the help in the world to keep my makeup in place. I've used this both as a primer and setting spray and on first thoughts I love the way it feels on my skin. I love the refreshing spritz, it's perfect in this weather. The scent is refreshing and kind of smells like cucumbers - there's nothing worse than having a cosmetic smelling scent on your face! I feel like the past week or two have been the toughest time to trial the Fix & Go spray. It's been stupidly hot and sweaty, so it really had a lot of work to do. Although my face did feel a little sweaty after a good few hours in this 30° heat whilst working, surprisingly enough my makeup hadn't budged all that much. I can honestly say that if I wasn't wearing the Primer & Setting Spray, I know my skin would be a big sweaty patchy mess. My face kind of felt like a big sweaty patchy mess, but in fact didn't look half bad! I would love to try this in more of a normal climate, to give it a fair chance. Originally I was after my trusty Stay Matte powder when the #Insta Fix & Matte Translucent Powder caught my eye. I'm so faithful to Stay Matte, I almost feel scared to try something new, I managed to talk myself into getting this due to the fact it's another Rimmel product and of course the 3 for 2! The first thing I noticed was the colour. I'm used to Rimmel translucent powder being a little skin coloured, so I was surprised and a little skeptical about the white powder. I don't know why but I was worried this powder would leave me looking as white as a ghost (obviously it didn't). Fix & Matte Translucent Powder instantly mattified and smoothed my skin leaving no fall out behind. This is perfect to get rid of oiliness and to minimise the look of pores without that cakey finish. Of course I was taking Boots up on their 3 for 2 offer and was on the search for a third. I picked up Rimmel's Wonder'full Mascara with Argan Oil. Now I don't think this is in the #Insta collection but I just couldn't help myself, it was in the promotion and everyone knows I can't resist trying a new mascara! I picked up the Extreme Black shade as I love a defined lash! First of all I love the packaging, to me it screams Summer ready. I'm also a fan of the thick brush. I love a full thick brush that really grabs and curls my lashes. The Argan Oil promotes smooth and clump free lashes and it certainly delivers! This applies so smooth and easy, there will not be a clump in sight. I think this is perfect for everyday lashes. You may not get your big massive full effect night time lashes, but you will however get beautiful smooth and clump free natural lashes. Your lashes can be thick and full but if they're clumpy, it ruins the whole look. I love the lightweight and natural feel to this mascara, it's perfect for the hot weather! Rimmel were the brand that got me so excited about makeup and really started my obsession off. I've been impressed with the new #Insta collection and I think when the weather gets back to normal, this can really help me with he whole "#Instaselfie" thing! I would love to try some more from their new collection and see if I can really give the whole flawless selfie thing a go! 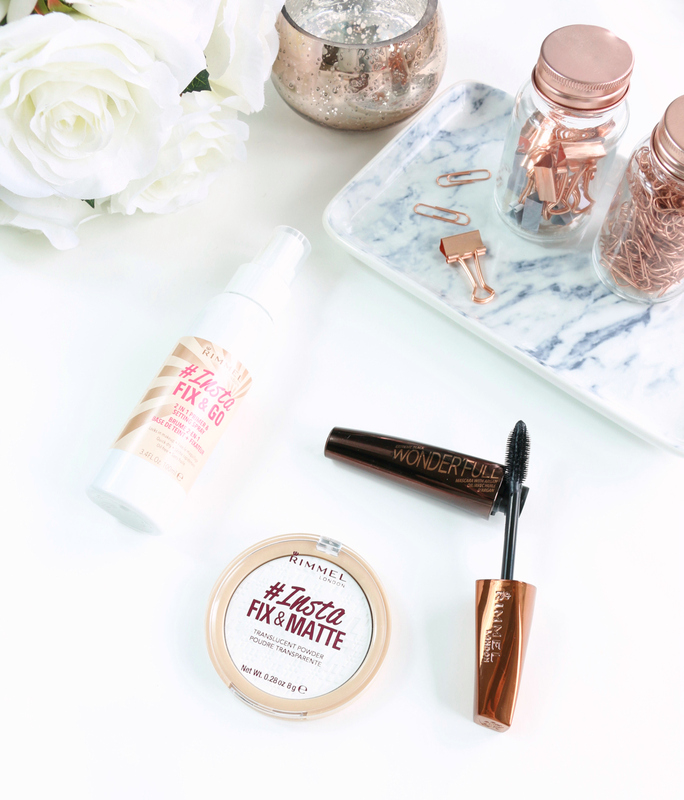 What has caught your eyes from Rimmel's new #Insta collection beauties? It's lovely in this heat! I love their argan oil mascara, it is fab! I definitely need to go and take advantage of this offer.